South Korea won Group C at the Asian Football Confederation (AFC) Asian Cup with a 2-0 win over China on Wednesday. Forward Hwang Ui-jo scored on a first-half penalty kick and defensive back Kim Min-jae headed in an insurance goal in the second half at Al Nahyan Stadium in Abu Dhabi, as South Korea completed the group stage with their third consecutive win. South Korea, chasing their first Asian Cup title since 1960, earlier defeated the Philippines and Kyrgyzstan by identical scores of 1-0. The much-maligned offense finally showed some life with Tottenham Hotspur star Son Heung-min making his first appearance in the tournament. In addition to the top two teams from each of the six groups, the four best No. 3 seeds will also advance to the round of 16. As the Group C winners, South Korea will face the third seed from Groups A, B or F next Tuesday at Rashid Stadium in Dubai. South Korea improved to six wins and four draws under head coach Paulo Bento, and ran their head-to-head record against China to 19 wins, 13 draws and two losses. After managing only a goal apiece in each of the first two matches, South Korean offense received a much-needed reinforcement in Son, who started as the attacking midfielder. The red-hot Premier League star arrived in Abu Dhabi Monday. He’d been held out of the first two matches by the Spurs, who had an agreement with South Korea that Son would miss the early part of the Asian Cup after playing for the country at last summer’s Asian Games. Son made an early impact. In the 12th minute, he earned a penalty when he was brought down by Zheng Zhi deep in the box. Rather than take the spot kick himself, the captain handed the opportunity to Hwang Ui-jo. The forward made it count, as he rolled a low shot past the diving goalkeeper, Yan Junling, to the bottom left corner. Hwang has now scored twice in three matches at the Asian Cup. China responded with a fast break opportunity in the 19th minute but Jin Jingdao’s volley sailed high over the net. Hwang Hee-chan threatened to make it 2-0 fo South Korea three minutes later, when his hard volley went right at Yan after Hwang Ui-jo teed it up with a headed pass. Just moments later, Hwang Ui-jo came within inches of scoring his second goal of the game. After positioning himself inside the left edge of the box, Hwang hit the far post with a shot that didn’t quite curl enough. 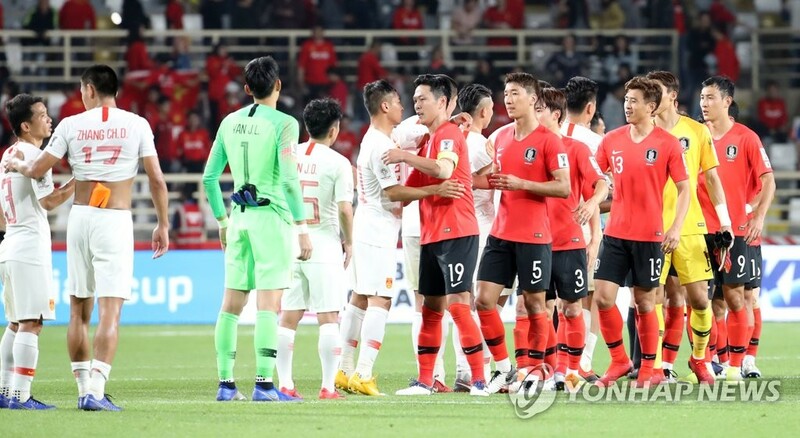 China, who were without injured midfielder Wu Lei, battled for an equalizer but South Korea held their ground on defense. Kim Min-jae then doubled the lead for South Korea six minutes into the second half, with Son again having a hand on the scoring play. As Son took a corner kick, Kim charged in from the top of the box and jumped over Zhao Xuri to head it home to make it 2-0. Kim had also headed in a corner kick for his first international goal against Kyrgyzstan last Friday. South Korea maintained their pressure on the attack, with China barely mounting much in response. In the 63rd, Hwang In-beom took a free kick that took a hop right in front of Yan and went off the goalkeeper’s chest. In the following minute, right fullback Kim Moon-hwan dribbled all the way to the middle of the box before shooting one wide of the goal. Son tried to work more magic in the 73rd minute, when he fed defender Kim Jin-su for an open chance. The shot went off the body of a defender and out of play. On a corner kick two minutes later, Son tried to catch China napping as he quickly poked the ball to wide-open Hwang Hee-chan, who fired it well right of the target. South Korea remained in control the rest of the match to clinch their third straight clean-sheet win at the tournament. South Korea are the first team at this year’s tournament to win all three group matches without conceding a goal. South Korea’s first knockout opponents will be determined Thursday, once all group matches are finished. In Groups A and B, Bahrain and Palestine finished their preliminary play as the third seed. In Group F, Oman and Turkmenistan are jostling for third place. They’ll play each other in their final group match on Thursday in Abu Dhabi, with the winner taking the third seed. South Korea will enjoy five offdays until the start of the knockout phase. And after playing the round of 16 in Dubai next Tuesday, South Korea will be back in Abu Dhabi for the rest of the tournament, if they go all the way to the final. If they had finished second in Group C, their first knockout match would have been on Sunday, with more traveling and far tougher opponents on the horizon.